I've had the pleasure of spending a little more free time making things again lately. I've missed sewing for fun, when I'm so busy doing all the other activities involved with running Oliver + S.
Just the right size for a few little springtime treats for S, who already noticed it and sneakily informed me she wanted, "Santa (Santa?) to bring me a little bag. One with ears." So subtle, she is. 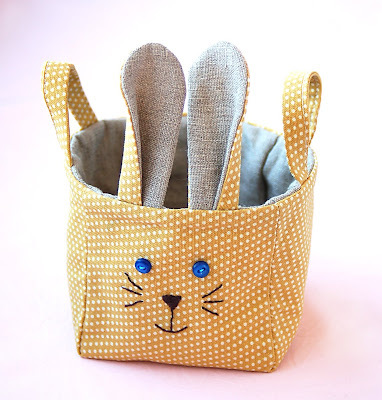 If you'd like to make your own Easter basket based on the pattern from the book, here is a download of the face and the ears that I used to make mine. You'll need some stiff interfacing for the ears, which get sewn into the top edge of the bag. Use the notches on the base of the ear pattern as a guide to help you fold approximately one third of the outside edge of the ear toward the center before you stitch it into place. The fold helps the ears to stand up and gives them a little dimension. Hippity hop! oh love it! will you also make a bunny bag or is this what she was referring to? very cute! That bunny bag is super cute! Love it! So much cuter than the ho hum baskets I've got lying around! 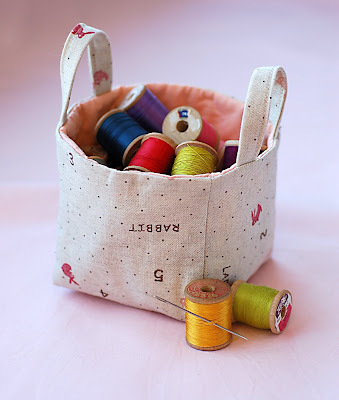 As if I didn't have enough projects back logged you have to go and show off this adorable bag which makes me toss everything else and want to begin on this for Easter! Too darling, just adorable! It's darling! Love the ears and your little one's Santa comment is too funny. Kids don't miss a beat do they? Have a great Monday. P.S. If you have any ideas for the Spring Swap I'd love to hear them! Thanks, Liesl! This is so cute--I'll be getting out my Zakka book. So much better than previous store-bought Easter baskets. SO CUTE! Unfortunately all of the copies (6) in my local library system are taken out with 11 holds on them once they come back! 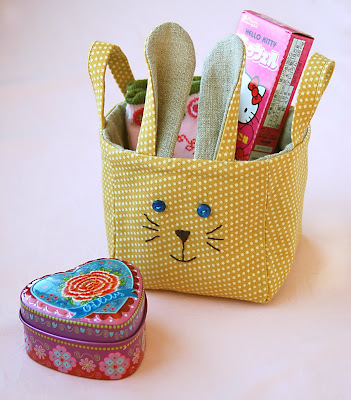 It looks like I may have to go buy this book to make this sweet basket (or look for a similar bag to modify). Thank you for sharing! Alright, this one's getting filed away in my "inspiration" folder. I love it! I made this bag a month or so ago and absolutely love it. I like how you turned it into a bunny. Liesle this is just adorable! This is so incredibly cute! great modification to the pattern. Thanks! That is adorable! Loved Tsia's hints. hehe! i love it! i have so many projects on the go, but how can i let easter come without a little basket like this for my 4-year-old? so cute. Keep me posted when you head this way this summer. A meet-up would be great! That is SO cute! I just love the blue eyes! I'll be linking. Oooh I love this. I was looking all over for a simple fabric Easter basket and couldn't come up with anything right. This is just perfect. I think I will pick up this book and make a set for all of my kids next year. Thanks. Awww.that's so cute. I tried to make one of the wrap baskets, it's cute, but WAY too heavy for my kid to use. That is so amazingly cute!!! Oh, I just love this! I have boys and most Easter Baskets are too frilly and girlie. I could totally tweak this style to make it more boy-friendly. AWESOME!! These are just so gorgeous! My daughter will want to make at least a few of these for her friends when she leaves her school!! It was certainly interesting for me to read that article. Thanx for it. I like such themes and everything connected to them. I would like to read a bit more soon. really cute & hope it is a quick sew-up & complete a couple prior to Easter. May have to take on that project for one of my home 'sew-in' with the girls! P.S. Just bought your new book a couple days ago. In love.